With help from the Army’s new in-flight Internet and mission command capability, commanders of Global Response Force units will be able to plan missions in the air, while their Soldiers receive operational updates and watch full-motion video of upcoming drop zones before their parachutes ever open. The joint GRF essentially consists of two components—the Air Force that supplies and sustains the C17 and C130 aircraft, and the Army’s XVIII Airborne Corps, primarily the 82nd Airborne Division. The GRF needs to be able to rapidly deploy at a moment’s notice and effectively command and control forces from the air. To help meet these requirements, the Army’s new Enroute Mission Command Capability, or EMC2, is being installed on C17 aircraft. The U.S. Special Operations Command, known as USSOCOM, which oversees the special operations component commands of each service, already has aircraft outfitted with their own version of this in-flight capability. The Army’s EMC2 system integrated on additional C17s would expand that initial USSOCOM capability, supporting the increased expeditionary nature of today’s forces. The Army began testing of EMC2 installed on the C17s at multiple locations this summer. On the current timeline, equipment is expected to be issued to the XVIII Airborne Corps by the end of the calendar year. EMC2 provides Internet service, mission command applications, full-motion video (FMV), intelligence products and collaborative planning tools along with a complete office suite of computers and voice phones—all onboard an airplane. It enables en-route mission command, so that as the situation develops in the destination target area, commanders will be able to get updates, understand changes on the ground and be able to adjust their plan to accommodate for those changes, Babbitt said. “It will be a transformation in the situational awareness and effectiveness of the GRF in the first several hours of ground operations,” he said. One of the main components of EMC2 is the Fixed Install Satellite Antenna, or FISA, which provides the Internet connection for the C17. Similar to the capability being used and implemented by today’s commercial airlines, FISA posed a low technical risk for Army adoption. From a frequency perspective, the Army is looking to utilize both Ku (commercial) and the military Ka-band in one antenna on the C17s for optimum bandwidth and efficiency. “The FISA provides a fourfold increase in bandwidth so that a new host of services can be employed on board, increasing capability for GRF units to plan and maintain critical situational awareness in the air,” said Capt. Mindy Brown, EMC2 lead for PdM WIN-T Increment 1. 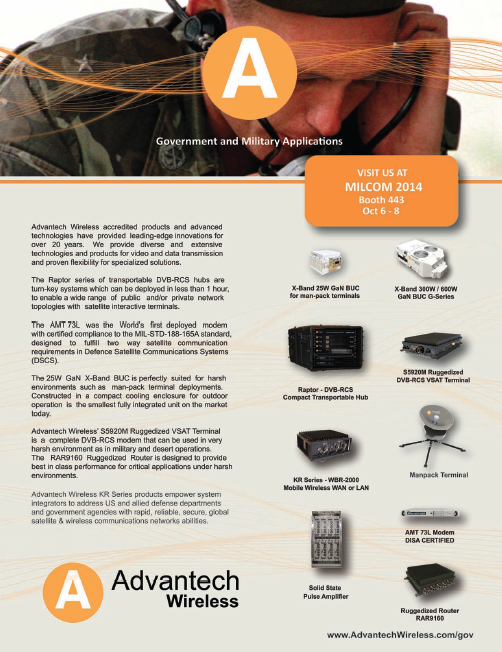 The U.S. military already has satellites, airplanes and drones that provide SD and HD FMV. With EMC2, those feeds can now be displayed on board the aircraft on LED screens, along with integrated marquees and an intercom system. “Being able to see the airfield where you are going to be landing, to see that drop zone, helps Soldiers get their heads fully into the operation so they are better prepared for the mission at hand,” Brown said. The key capability of EMC2 does not just reside in the antenna, but also in the incorporation of the Key leader Enroute Node. It will provide airborne units with broadband reach-back data capability; secure Voice Over Internet Protocol communications between task force commanders and combatant commanders; as well as communication between aircraft. “For the GRF, EMC2 is an absolutely disruptive technology to the traditional way of doing business, and will transform operations,” Babbitt said. 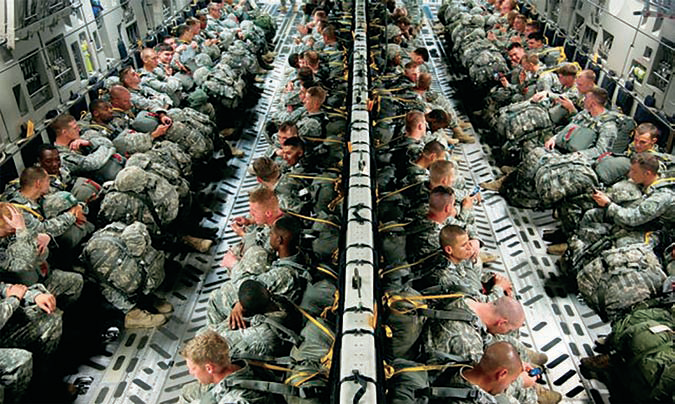 As part of the GRF mission, with the Air Force providing the aircraft, the Army’s 82nd Airborne Division has deployment-ready paratroopers and infantrymen who can provide an immediate military capability on the ground in a very short period of time to any location worldwide. In 1991, in its role as GRF, the 82nd Airborne was the first force on the front line between Saudi Arabia and Kuwait, shortly after Kuwait was invaded by Saddam Hussein’s troops. The GRF was also activated for a humanitarian mission during the earthquake in Haiti, in 2010. Army’s evolving force structure as it strives to become a leaner, more capable and expeditionary force. 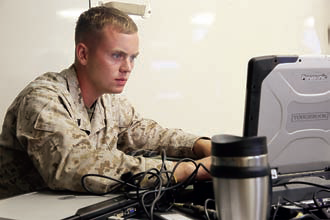 Advanced network capabilities such as EMC2 will continue to increase force mobility and agility by making it easier for Soldiers to get the information they need to be successful, anytime, anywhere. The U.S. Air Force’s fleet of Global Positioning System (GPS) Block IIR and IIR-M satellites, manufactured by Lockheed Martin [NYSE: LMT], have reached 200 collective years of operational life. 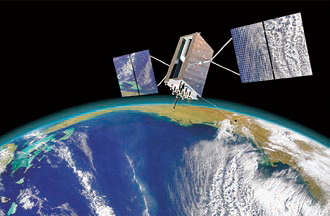 Artistic rendition of a GPS III satellite on orbit. Image courtesy of Lockheed Martin. These 20 satellites—about two thirds of the current GPS constellation— help deliver precise positioning, navigation and timing services to more than one billion global military, civilian and commercial users every day. Originally launched between 1997 and 2009 to add capabilities to the GPS constellation and to replace other aging satellites, the 12 GPS IIR and eight IIR-M satellites have maintained an unprecedented availability record of 99.96 percent. That represents only 10 minutes of downtime per satellite during all their years of operation. This spring, the IIR-M satellites played a major role in the continued modernization of the GPS constellation. 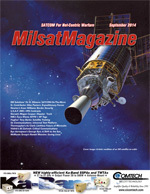 To help manufacturers develop and test next generation advanced civil GPS receivers, under the direction of Air Force Space Command and in collaboration with the Department of Transportation, these satellites began early broadcasting of test civilian navigation, or CNAV, messages on a new signal planned for all future satellites. Making these milestones even more significant is the fact that the GPS IIR and IIR-M satellites were designed to last 7.5 years, or collectively about 150 years. All 12 IIR satellites are currently operating beyond their design life with the oldest operating for more than 16.5 years. Three of eight GPS IIR-M satellites have surpassed their expected life span and all satellites will have done so in 2017. To meet evolving GPS user demands, Lockheed Martin is already developing the next generation GPS III satellites, which will deliver three times better accuracy, provide up to eight times improved anti-jamming capabilities, and include enhancements which extend spacecraft life to 15 years, 25 percent longer than the newest Block IIF satellites. GPS III will be the first generation of GPS satellite with a new L1C civil signal designed to make it interoperable with other international global navigation satellite systems. Members of Marine Tactical Air Control Squadron 28 recently participated in their first mobility exercise in Sunset Park at Cherry Point, North Carolina. The exercise, held in preparation for the upcoming exercise Bold Alligator in October, tested the squadron’s ability to move a tactical air command center forward to support the ground scheme of maneuver. A TACC is capable of possessing the ability to provide data link infrastructures, radar pictures, satellites and maintain visibility of all aircraft within the operational area. Along with the TACC, the exercise also contains components such as Humvees and modular extendable rigid wall shelters, which contain the display board, the eyes and ears that allow the commander to see what is going on, said Staff Sgt. Tremaine C. McCallum, the staff non-commissioned officer in charge of the exercise. “The MOBEX and TACC will provide the wing commanding general with the command and control which will provide the accurate information needed to get the mission done,” he said. 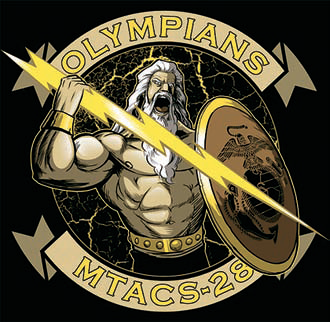 The exercise allowed the Marines of MTACS-28 to brush up on perishable skills. “The MOBEX is a huge benefit to the squadron because when we train to support a MEF-level contingency, we don’t get to really work with motor transport, utilities or S-4 as much as we would like to,” said Brown. TACC’s are made up of coordinators and operators who work together for the exercise to run as smoothly as possible. “Your coordinators are going to be your staff non-commissioned officers, and your operators are going to be your junior Marines,” said McCallum. Cpl. Michael Allen, a TACC operator during the exercise, said he was one of many responsible for the coordination and movement of the TACC from one location to the other and believes the exercise is important for the squadron to grow. “This exercise is important so we do not lose any of our skills, so when something happens in the real world, we don’t forget how to do it,” said Allen. “For our first MOBEX, this is going great. We set up the whole thing in a day and a half, and I’m looking forward to the next one.,” he added. A team of scientists from the Coast Guard Research and Development Center, New London, Connecticut, headed out aboard the Coast Guard Cutter Healy for a series of technology evaluations in the Arctic and conducted operations off the North Slope. 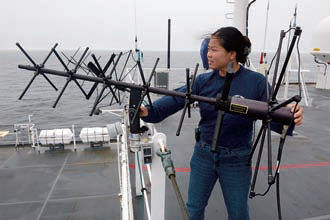 Amy Sun, an advanced program lead for Lockheed-Martin, adjusts a UHF antenna aboard the Coast Guard Cutter Healy while underway near Alaska. Sun works with narrowband military satellite systems and is aboard the Healy to test the capabilities of the Mobile User Objective System in the Arctic. USCG photo by Petty Officer 1st Class Shawn Eggert. The RDC is leading a multi-agency and international team to support Arctic Shield 2014, a 17th Coast Guard District initiative. The purpose of their month-long evaluation is to improve Coast Guard capabilities in the Arctic region, specifically in the areas of boat operations, communications, navigational safety and oil spill response. The RDC is collaborating with the U.S. Army Corps of Engineers Cold Regions Research and Engineering Laboratory to assess improvements made to Coast Guard boats using commercial off the shelf products to enhance capability in a cold weather environment. The RDC is also assessing Arctic communications. Over the past year, the team has been modeling High Frequency, Very High Frequency, and Ultra High Frequency coverage in the Arctic region. While onboard the Healy, the team will validate their communications coverage models and use the information to improve future coverage predictions. Additionally, U.S. Northern Command and its contractor, Lockheed Martin Corp., will help the RDC assess Mobile User Objective System satellite coverage at high latitudes. MUOS delivers secure voice and high-speed data to mobile users using an advanced waveform similar to cell phone technology. Understanding the extents of its coverage could have marked impacts on Arctic communications. “The ability to communicate weather, ice and other safety information is going to be vital to vessel traffic as more mariners look to northern waters as a means of passage, commerce or recreation. This is a tool that benefits anyone with a stake in the Arctic Ocean,” said Lt. Cmdr. Mike Turner, RDC Arctic navigation lead. The RDC will also continue its study of oil spill response in ice. The National Oceanic and Atmospheric Administration, the National Science Foundation, the National Ice Center, Space and Naval Warfare Systems Command, the University of Cambridge and the University of Washington’s Applied Physics Laboratory are providing personnel, unmanned technologies and resources to help the RDC better understand how to detect and track a simulated oil spill as it moves in the water near the ice edge. The science team wrapped up operations on August 30 and returned to New London to deconstruct collected data. Story by Lt. Keely Higbie, U.S.C.G. Communications & Power Industries (CPI) Satcom Division has been selected to supply high power uplink amplifiers (HPAs) to support the Brazilian government’s new Geostationary Defense and Strategic Communications Satellite (SGDC). 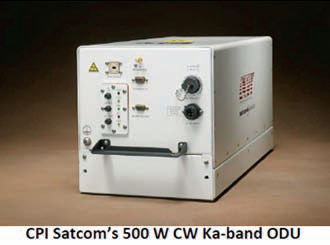 CPI will provide 500W continuous wave (CW) Ka-band TWTAs, which will be used for critical telemetry, tracking and control. The SGDC satellite will be dedicated to strategic communications for the Brazilian Ministry of Defense, and broadband services for the Ministry of Telecommunications. The launching and operation of the satellite will be performed by Visiona Tecnologia Espacial S.A, a joint venture between Telebras Telecomunicacoes Brasileiras S.A. and Embraer Defense and Security. 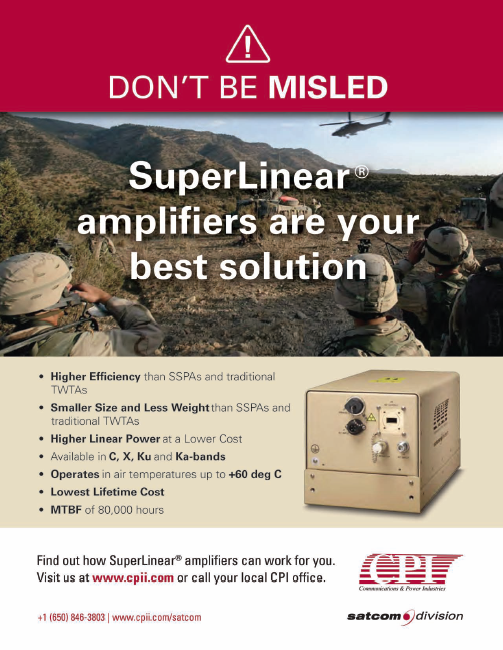 CPI has shipped more than 2,000 Ka-band high power amplifiers to customers around the world, and is also a leading supplier of HPAs for uplinks in all standard operating frequency bands. Most of the company’s products are ANATEL certified for import to Brazil. 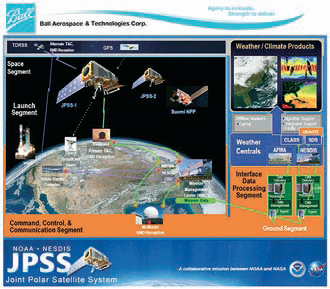 A sole source contract modification hsa been awarded to Ball Aerospace and Technology Corp. of Boulder, Colorado, for the Ozone Mapping and Profiling Suite (OMPS) for flight on the Joint Polar Satellite System-2 (JPSS-2) mission. The JPSS-2 mission is funded by the National Oceanic and Atmospheric Administration (NOAA) to provide global environmental data in low Earth polar orbit in support of NOAA’s mission—NASA is the acquisition agent for the flight systems and components of the ground system. This is a cost-plus-award-fee modification in the amount of $113 million. This action extends the period of performance of the contract from November 2013 through May 2021. Under this contract, Ball Aerospace and Technology will manufacture, test and deliver the OMPS instrument, support instrument integration on the JPSS-2 spacecraft and provide launch and post-launch support. The OMPS instrument will be similar to the OMPS currently flying on the joint NASA-NOAA Suomi NPP mission and planned for the JPSS-1 mission. JPSS-1 is being planned for launch in 2016 and JPSS-2 is planned for launch in 2021. OMPS will monitor ozone from space, collect total column and vertical profile ozone data, and continue the current daily global data provided by the Solar Backscatter Ultraviolet radiometer-2 and Total Ozone Mapping Spectrometer. The collection of this data contributes to fulfilling the U.S. treaty obligation to monitor the ozone depletion for the Montreal Protocol to ensure no gaps on ozone coverage.